Terry Hancock is an amateur astrophotographer whose images have been published by NASA and featured in Astronomy, Sky At Night, and Sky & Telescope magazines as well as in National Geographic, The Daily Mail, Yahoo, Space.com, and many other well-known online publications. Born in Burnley, Lancashire in the north of England, Terry Hancock migrated with his parents as a child to Australia. He was inspired by the writings of Sir Patrick Moore and first learned astronomy under the dark skies of the Australian outback in Northern Victoria. In 2000, Terry moved to Western Michigan in the United States where he continues to refine his skills in the art of astrophotography. Terry does talks for astronomy clubs, schools, libraries and various groups. He also provides online tuition and support on the subject of Amateur Astrophotography, particularly for the beginner with advice on equipment, image acquisition and processing, whether using a DSLR or a CCD camera. All of his astrophotography is captured from his backyard. The equipment he uses is mounted in an 8’x8’ shed which houses an 8” Astrograph, a 12” Ritchey-Chrétien telescope, several QHYCCD cameras, and a Paramount Robotic Mount which is controlled remotely from the inside of his home. Terry’s images are published regularly in Astronomy, Sky and Telescope, and Sky At Night magazines, as well as The Daily Mail newspaper and in many well-known online publications. His work has been exhibited nationally and internationally, as well as locally at the annual International Art Prize based in Grand Rapids Michigan. When not actively imaging the night sky, Terry teaches astrophotography online and speaks about astronomy to schools, clubs, and other associations. 1. How long have you been an astrophotographer? I first dabbled in astrophotography during the mid 80's using film, but I later took up the craft more seriously with digital astrophotography from 2006 until the present. 2. What inspired you to become an astrophotographer? Photography and astronomy have both been my hobbies since I was a child. Later on I decided to combine the two. 3. Where do you do most of your imaging? The majority of my imaging is done from my backyard observatory, and some I do from the Stephen Wessling Observatory. Both are in Fremont, Michigan. M16 The Eagle Nebula by Terry Hancock. 4. What’s your current equipment set-up (cameras, telescopes, and mounts)? 5. Why did you choose this set of equipment? I like to have one telescope for wide-field deep-sky imaging (the Tak E-180) and another telescope for smaller deep-sky objects (the AT12RC). 6. How many hours a month, on average, do you spend imaging? Typically, depending on the weather, I spend 20-40 hours imaging. M42 The Horsehead by Terry Hancock. 7. What sights in the night sky do you still want to image, but haven’t yet? There are an infinite number of objects I would like to image, certainly way too many to list here :) This coming winter I would like to expand on my collection of images that make up my Orion Mosaic to eventually include Barnard's Loop. 8. What motivates you to go out with a telescope to do the hard work of imaging night after night? I don't consider it hard work. I do this because it's fun, it's my passion and some might call it an addiction. 9. Do you have advice for beginning imagers? Yes. First of all do not go out and buy a big Schmidt Cassegrain on a fork mount for imaging. I see occasionally dealers selling these scopes to beginners, and they are totally unsuitable for imaging for beginners. I recommend a small apochromatic refractor with focal length between 65-100mm, an EQ Mount with GOTO, and a Canon DSLR camera or, if you have the budget, a one-shot color CCD with good cooling for low-noise performance. 10. What you wish you knew when you got started? Oh darn! I wish I had read this question before I gave the last answer :), I made the fatal mistake of buying a BIG Schmidt Cassegrain on a fork mount. So many mistakes I made buying equipment and learned the hard way but it was part of my learning curve. 11. Can you share one of your best ever imaging results? 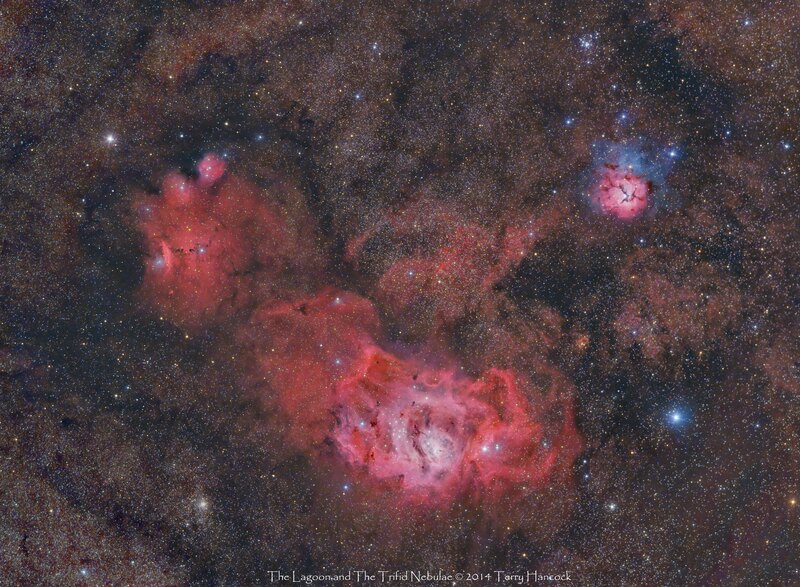 This image of the region around the Lagoon and Trifid Nebula in Sagittarius is one of my favorites. Sagittarius Orchestra by Terry Hancock. 12. What’s your opinion about remote imaging with robotic telescopes? Is that the way of the future? Yes most definitely, this is becoming very popular for people who live in very light polluted areas and for serious imagers who wish to rent high-end equipment rather than buying their own. There are also many big-name imagers who use remote imaging in addition to having their own equipment. There is now a big selection of remote sites available all over the world where equipment can be hired for a modest cost. Personally, I prefer to capture my own images here at home because doing it myself is half the fun. 13. What other interests do you have besides stargazing? I don't have much time for my other hobbies these days but I do enjoy photography, PC repair, cooking and travelling. 14. Do you have a website? Where can we learn more about you? This article is © AstronomyConnect 2015. All rights reserved. Images © Terry Hancock 2015. All rights reserved. GrandPrixChris, Crow Haven and StaringAtStars like this. Also, his images are featured in articles in "Astronomy" magazine and also in the back with other people's images from time to time! We have a mutual friend and what I hear of Terry is that he is a stand up guy! His images are phenomenal! I love that Horsehead photo! I completely agree with Terry on question 12. Capturing your own images from home is half the fun.